1. Most of us are visual beings. We understand better and quicker when things are presented to us visually. This is not surprising: images are more attractive and less boring than text. 2. Image sharing has become a new form of expression. We share over 500 million photos everyday according to Mary Meeker’s Internet Trends 2013 report. Connecting with people through small devices and the necessity to communicate quickly and efficiently encourage this new trend. We came up with Pikiz to help anyone create and share creative images. 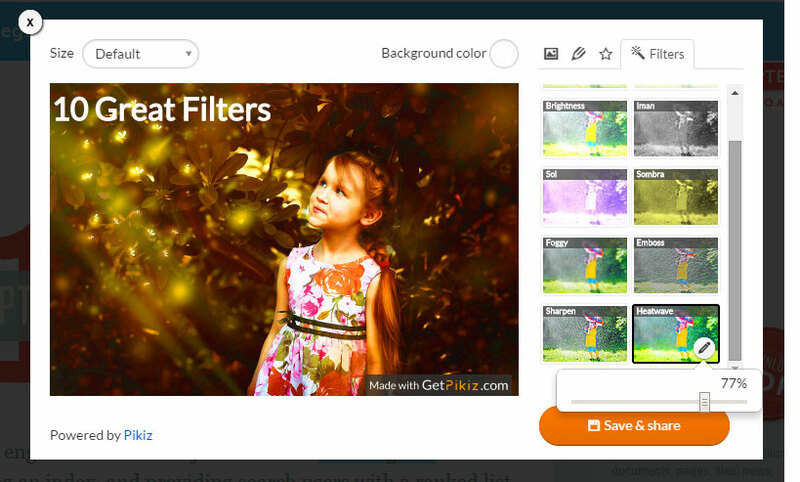 Pikiz offers an easy way to edit text or any image. We have included a comprehensive collection of images with more on the way. You have a choice between our high quality images, solid backgrounds and your own images. Our gallery covers various categories from breathtaking landscapes to beautiful images of people. These categories simplify your research in the gallery. In case you want to edit your own image or picture, you can upload it without reducing the quality. Pikiz also provides color palettes you can use as solid backgrounds. The choice is yours, select the perfect background and give a special tone to your message. 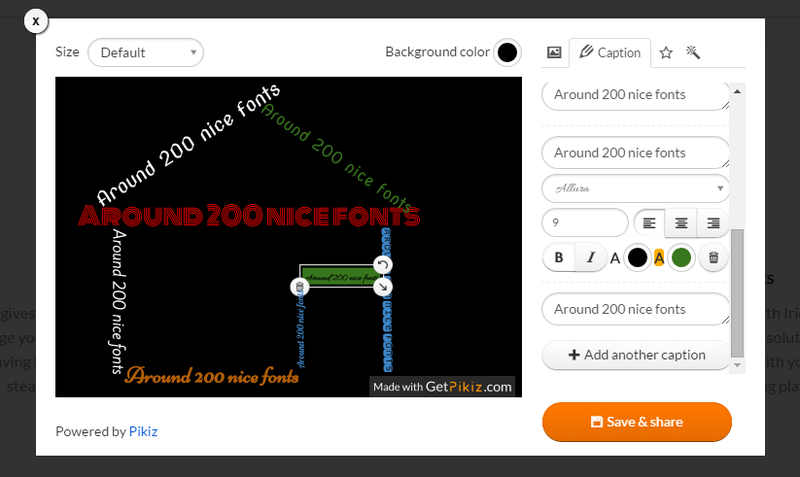 Pick nice typefaces in the image editor to impress your friends or followers. You can directly chose fonts size or just simply stretch the text field till you are satisfied. With Pikiz, you can apply any font color to emphasize words and captivate your audience. You can move your text anywhere on the image, rotate it and even select a color background for the text field. It is nice to use stickers on social media. You can have fun and let people know how you are feeling by using our nice emoticons, stickers, arrows and shapes. At the moment we have 6 collections of stickers and there are all free. We are still adding useful stickers to make your message lively. Can also upload your own stickers or logos free of charge. 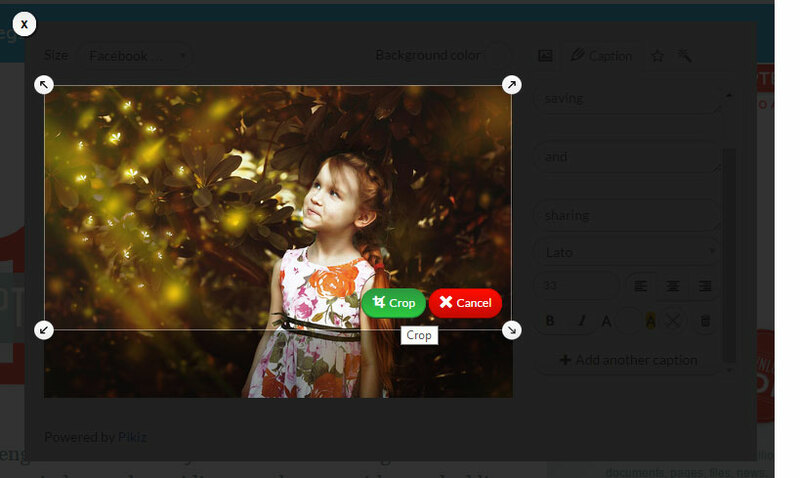 Customize your image by using effect. Our image editor allows you to apply creative filters such as transparency, brightness, grayscale, sepia and more on your image. These filters will help you reduce the noise on a busy background, make your text more visible and create nice effects. Another important feature we added to Pikiz is the saving and sharing option. 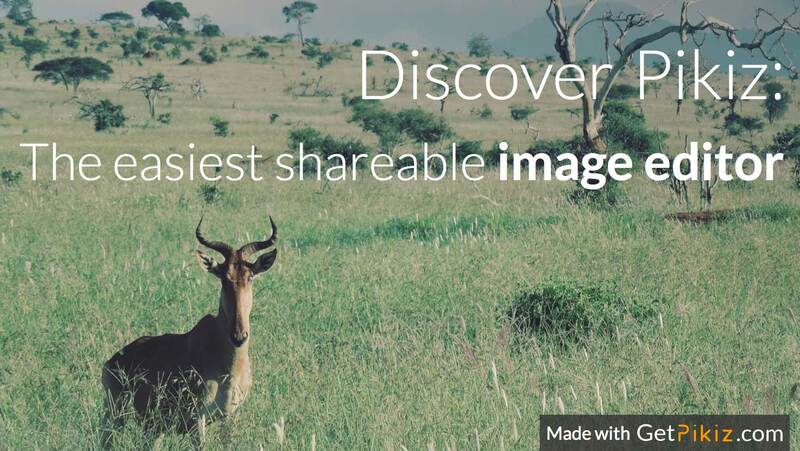 After saving your image, you can share easily it with anyone. Whether on Facebook, Twitter, Google+, LinkedIn or Pinterest your post will always fit their format. Just choose the size when you start editing. 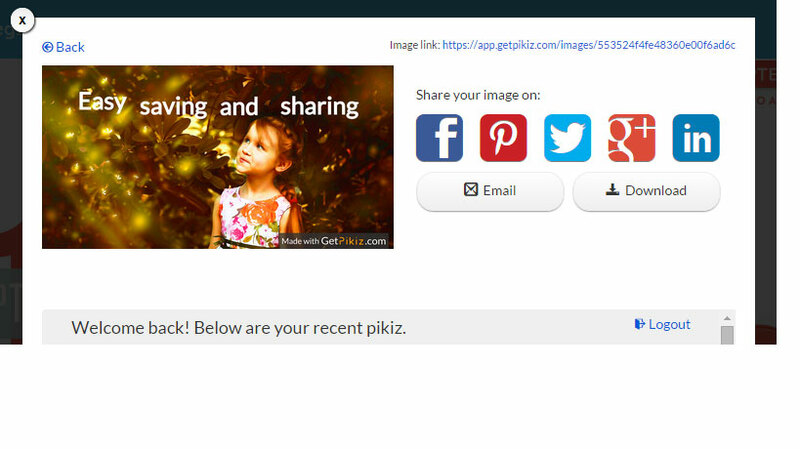 Once you finish, you can share on the relevant social media, email your Pikiz to a friend or download it for other use. 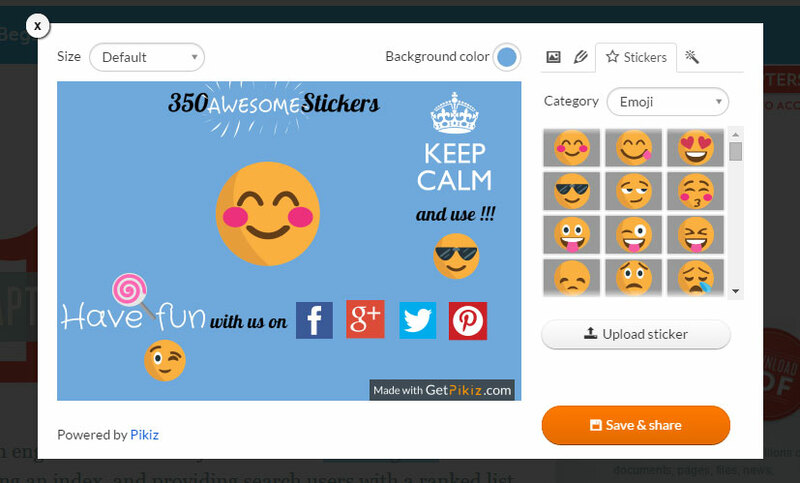 Use Pikiz as a fantastic tool to share feelings, ideas, and promote your business through creative messages. 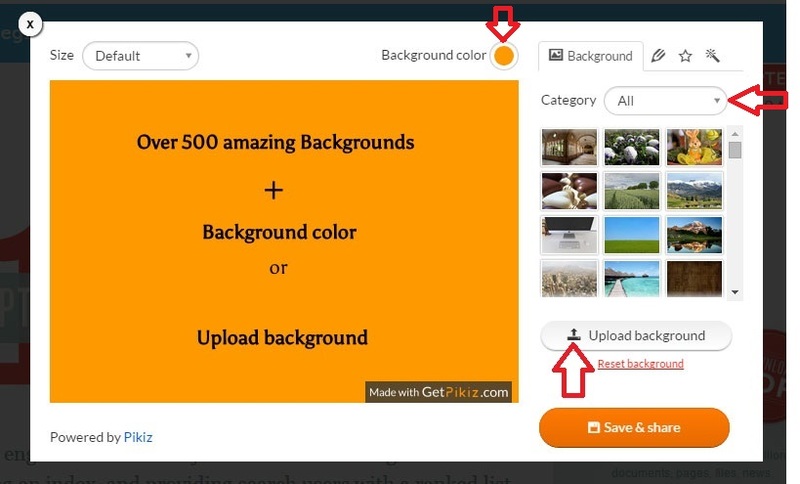 Read our article on How to create engaging images for social media in less than 5 minutes and Create and Share Viral Images from Anywhere with Pikiz to have more information on how to properly use Pikiz features. Currently, Pikiz extensions works only on computers but we are working to make it available all devices. We also promise more features to help you unleash your creativity.